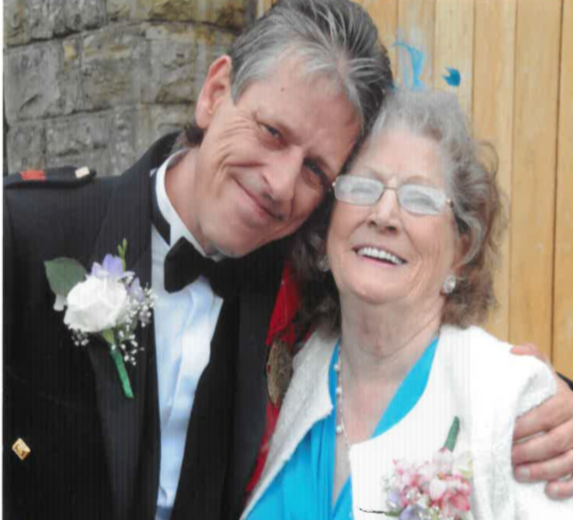 “During June 2016 my Mam Pat suffered a fall whilst shopping, she was admitted to Hospital with a broken shoulder, the X Ray taken revealed a shadow on the lung but they were unsure if it was malignant as they were unable to take a biopsy due to existing COPD, however, as a precaution she received radiotherapy and made a good recovery. Things changed in June 2018, Mam was suffering bad headaches”. Initially Layne was unaware of how severe his mum’s headaches had become, he was extremely close to her. As an only child she was his life and they were extremely close, he felt that she was trying to shield him from the extent of how unwell she was and didn’t want to worry him. Layne’s mother Pat lived next door to him in a one bedroom flat where he visited her at least three times a day, cooking and generally looking after her also making sure at night that she was ready for bed. One day while visiting his mum he became concerned as she was confused about her medication and had been overdosing on Paracetamol. Layne took her immediately to Nevill Hall Hospital where after tests they were given the devastating news that his mother’s prognosis was terminal and no treatment was available. Layne was asked if he wanted support from the Hospice and at that point he had never heard of the charity or what they did, but he was relieved to be offered some help. At first the nurses met Pat at Layne’s home where she went to live after her discharge from Hospital as she was to unwell to return to her flat that she loved so much. The Nurses visited twice a week, the Physiotherapist also visited and was able to offer Complementary Therapy which helped her, as being inactive meant her legs muscles were wasting, so this helped her regain some feeling. The Family Support Officer was also asked to support as by now Layne was reaching breaking point and struggling to come to terms with his mother’s prognosis. As Pat’s condition deteriorated mobility and using the stairs became a struggle, the hospice was able to quickly arrange for a hospital bed to be delivered to the house to make her more comfortable. upport Officer was like a therapist and seemed to be able to answer all my questions and what he said made sense, he could feel and understand what I was going through. I felt close to the edge and in a really bad place but he encouraged me to attend Activate your Life sessions at the Hospice, this helped me to look at things in a different light, I was unable to change what was happening but learned to look at things in a different light and live for today. This put me in a better place to accept what was going to happen. I knew I wasn’t on my own, he really helped me and I can’t praise him enough”. Layne shared that his GP had prescribed him medication to help him relax but attributes not taking all the medication prescribed to the Hospice and the support he received. Layne was then faced with another problem, when Pat became so unwell that she needed to move in with him he then had to arrange for his mum’s flat to be emptied and the tenancy handed back to the landlord, this was another unwanted hurdle at a difficult time. Thankfully the Hospice was on hand and arranged for the retail van to clear the flat and for furniture to be taken to one of the Hospice charity shops, this was one less thing for Layne to worry about. Alongside the care and support Layne and his mum received they also had spiritual support from the Hospice Chaplain Rev Roy Watson, this was so important to Pat and they had regular visits from Roy which were of great comfort. Layne reflected on a happy memory where Roy came to the house with a small font and baptised them both in the living room, he proudly showed me the Baptism Certificates and Bible that was gifted to Pat which are now treasured possessions. When Roy visited her face would light up and she looked forward to seeing him. 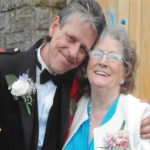 Pat passed away in January 2019, Layne contacted the Hospice straight away and a nurse came out to see them and take care of all the necessary arrangements, although devastated by his loss the support that he received has enabled him to cope, again Layne reiterates how he cannot thank the Hospice enough. Layne was asked what Hospice of the Valleys meant to him. Layne has since realised that due to the support the Hospice has given him he has committed to give something back to the Charity he knew nothing about until his Mother became ill, he is currently exploring opportunities to support as a Volunteer so that we can continue to provide our patients with such vital care.